This guide includes the best sleeping bag for bike touring. Enjoy. Your sack is arguably the most important piece of gear that you bring on a bike tour. It’s essential for warmth, comfort, and helping your body to get the rest it needs after a hard days cycling. Your camping bag will also be one of the heaviest and most awkward pieces of equipment. So it’s a good place to try and save on if you can. Warmth and comfort vs. weight and size are the battles you have to face when choosing. When you start looking for the perfect balance, you’ll quickly find there are a lot of options out there. So I decided to create this guide to identify the best. Hope it helps. 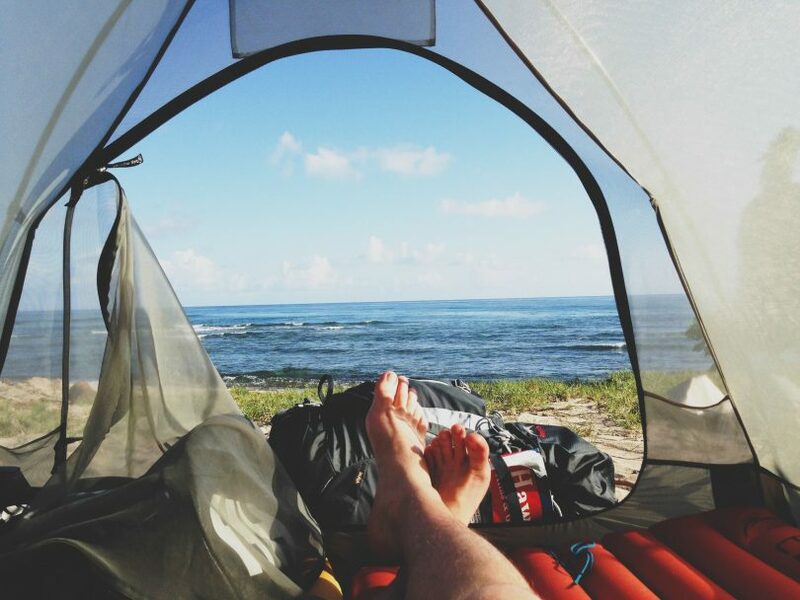 Camping bags come with temperature ratings to help you choose the best bag for your trip. You’ll also most likely come across something called an EN temperature rating. EN stands for European Norm 13537. EN is the standardised temperature rating system that keeps ratings consistent across different brands. When looking at EN temperature ratings, there are two main numbers you’ll want to look for and consider - The comfort rating and the lower limit rating. Comfort Rating - The lowest temperature in which the average woman will sleep comfortably in that bag. Lower Limit - The minimum temperature in which the average man will sleep comfortably in that bag. The rating will assume that the sleeper is wearing a layer of long underwear and using a sleeping pad underneath their bag. There’s also an extreme limit, which is the coldest temperature you could survive without freezing to death… A bit much if you ask me, but it is what it is. Related: Best Cycling Gloves For Long Rides: Want Feeling Bag In Your Fingers? As a rough guide for seasons, bags are typically categorized like this. Now, what might feel like the perfect sleeping to conditions for some, might feel like sleeping in an igloo for others. Likewise, one person might be snuggled up as they descend into a pleasant night of non-stop slumber, while the person next to them is swimming in a pool of sweat. Basically. It isn't an exact science. Some people like it hot, and some people like it cold. In general, men sleep about 10 degrees warmer than the woman. So they should choose a bag with a higher temperature rating. You also need to take into consideration where you intend to cycle through. If you're planning to cycle through Asia, then a 15F sleeping sack is probably too much. 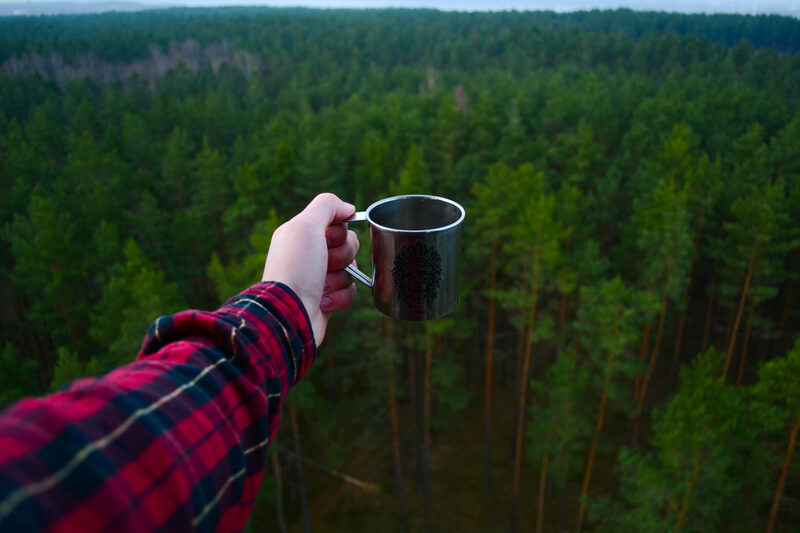 But what if you're doing a crazy world trip? Temperatures are obviously going vary as you pedal across different continents. Here I would suggest buying a 3-season bag that's able to handle most weather conditions, and then layer up on colder nights. Wearing extra long johns, hats, gloves and full-face balaclavas. Can all add to boost the warmth of your body when you've got icicles hanging off your beard. There are two types of bag insulation to look at - down and synthetic. A synthetic insulation bag will be warmer to sleep in if it gets wet, although you're guaranteed horrible nights sleep in a wet bag regardless of the material. The good thing about a synthetic insulation bag is that if it does get wet, hanging it on the back of the bike will enable it to dry quicker than a down bag. Here's an old video of Darren Alff from Cycle Touring Pro. Whilst talking about sleeping bags, he mentions this tactic 1 minute into the video. He also mentions that he keeps his bag inside his panniers for extra wet weather protection. There is two type of sleeping bags on today's market: "Mummy" sleeping bags, which are traditional bags, and the new guy to the party, quilts. There are also some bags, such as the Sierra Designs DriDown Backcountry Bed, which combine properties of the two. Quilts have been rising the ranks in recent years to become pretty popular. Especially amongst those that are on an ultralight tour, and trying to save as much weight as possible. 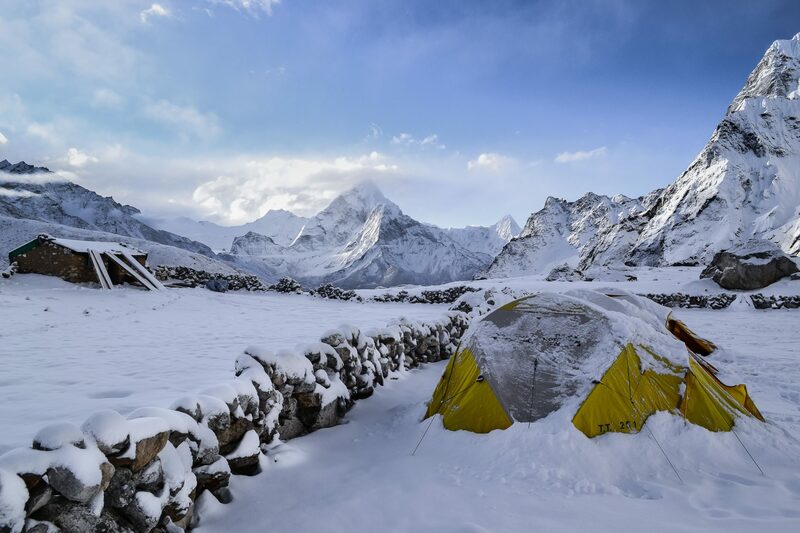 Using a quilt is pretty much like sleeping under your duvet at home, except the mattress is​ your sleeping pad, as you can imagine this cuts down the weight and any unnecessary insulation quite considerably. Some quilts have closed foot boxes, and some can be attached to the sleeping pads themselves, helping keep in the heat. If you want to be as insulated as possible, then Mummy sleeping bags are the way to go. Sure, they're more restrictive, but they'll keep the heat in better as you're in a fully enclosed system with a hood. If you're off to a place with known cold temperatures, then Mummy bags should be at the top of your list. 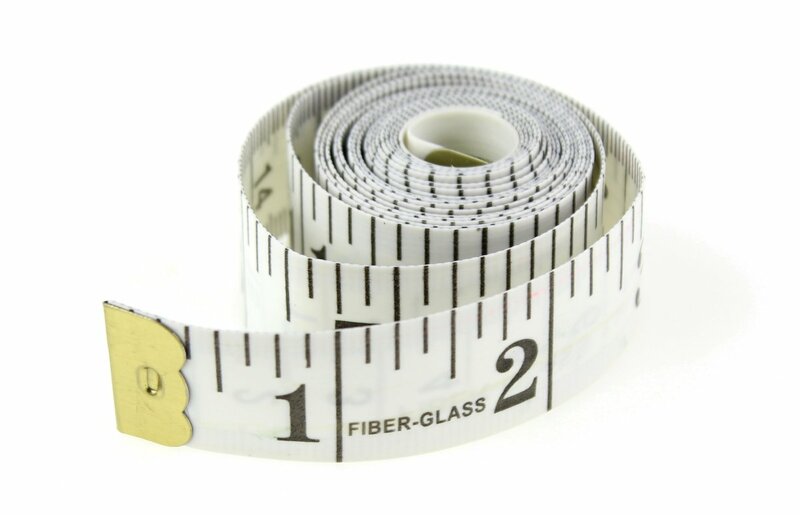 Make sure you check with the manufacturer to find the correct length for you. With quilts, if you're close to needing the next size up, consider going for that instead. That way you'll be able to chuck it over your head on especially cold nights. Mummy bags will typically come in a "one size fits all" width. So if you find that the fit is too slim for you, you'll most likely have to look at a different model. Slim cut bags are great for saving weight and space, but they're more restrictive. It's also important to consider if you'll wearing a thick coat for extra warmth at any time. You'll want to make sure that you buy a bag that still has enough room for you. Different length zippers are something to look out for on Mummy bags. Full-length zippers are what most people go for because it gives you the flexibility to open up the sack completely for ventilation. 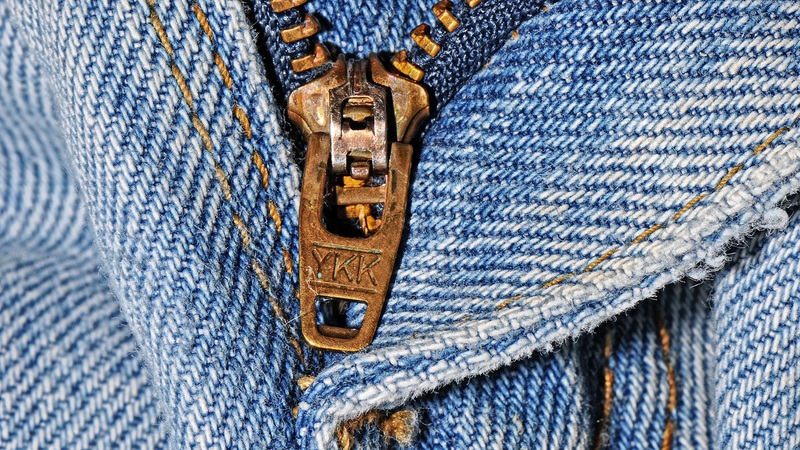 Sometimes bags will cut down on the zipper length to save on weight. If you don't mind having your feet tucked in this may be a possibility for you, but I think most people would like to have the option to open it up. More or less all Mummy bags will come with a hood so you can cocoon up and keep your head warm, ​this is not the case with quilts. If you go for one of these, you'll have to find another way to keep your head warm on cold nights. Most people choose to wear a warm hat. DWR is a type of treatment that will make water bead up on the outer shell of the sleeping bag rather than soak in. Reapplication is required over time as treatment will wear off. The sack will be far from waterproof, but it's good to know your bag won't turn into a giant wet sock if it gets wet. For any online purchase that deals with a large sum of money, you'll want to make sure you're up to speed on their returns policy before hand. I'd recommend buying your top choice and testing it out at home. This way it doesn't get dirty/damaged, and you can just return it if it doesn't feel right. I'll never forget the day I was unable to return some football boots that were too small. But that's what happens when you wear them in the mud... Don't let the same thing happen with you and your bag. The Nemo Tango Solo Down Comforter is the perfect balance between lightweight and comfort. Ideal for bike tourers who are looking for a comfy sleeping system that's extremely innovative. The standout feature with this quilt is the way that it integrates with a sleeping pad. Unlike a traditional mummy bag, that sits on top of the pad. Because this design has an uninsulated bottom, it's better to think of it as a blanket that has side walls. Underneath there are stretchy pockets that fit over the bottom of your sleeping pad to combine the two together. However, because there is no bottom to this quilt like a traditional mummy bag, you'll have to make sure you get a comfortable sleeping pad. If you intend on having just a sleeping bag (I wouldn't advise this), then a quilt is not for you. 700 Fill DownTek means the quilt is high quality. 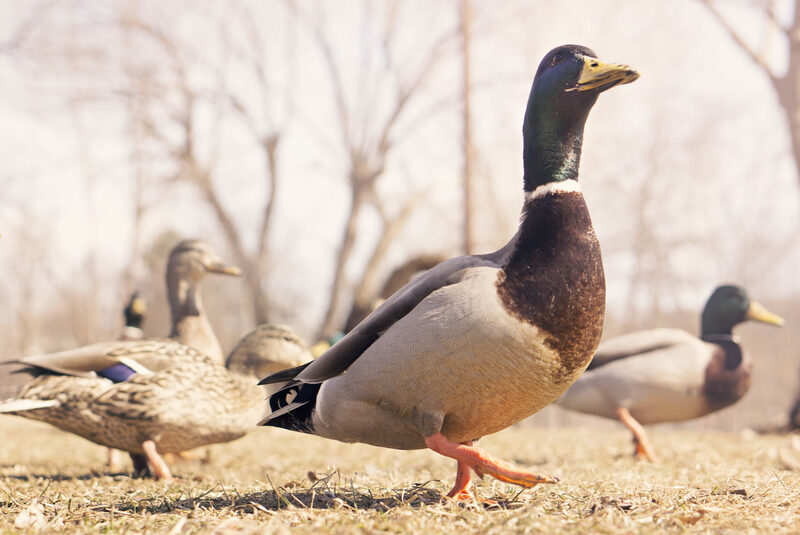 The important thing to know about DownTek is that you have the ultra compressible, lightweight features of down, but water resistant coating is covering the material. So any rain or moisture from the air is going to be repelled by the quilt. In the foot box, there is a waterproof material called OSMO DT W/B. 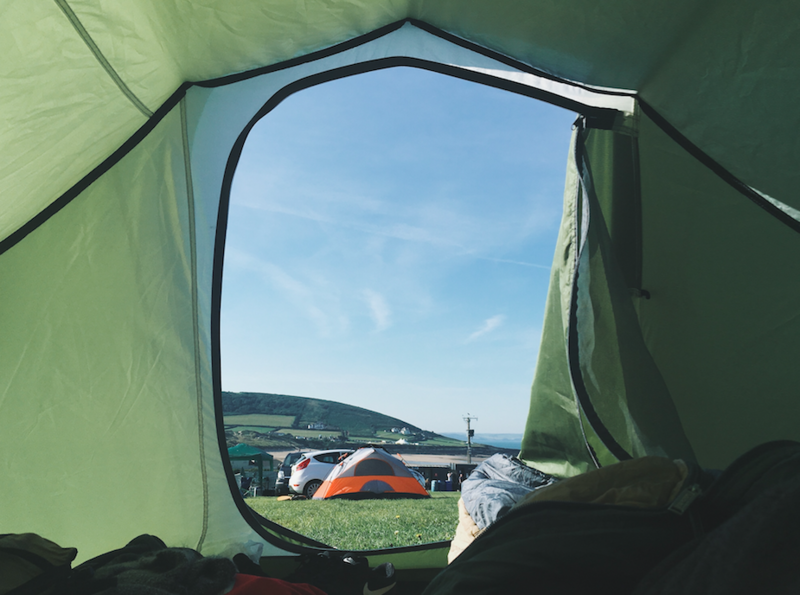 OSMO DT W/B means it's going to stay dry against the walls of your tent. As you can imagine, there's a high chance of your feet rubbing up against the walls. Due to it's well thought out design that isn't going to happen with this quilt. There are boxes throughout the quilt that is stitched with a stretchy material. The reason for the boxes is so that you don't get any shifting of the Down, and consequently cold spots. The stretchy stitching gives you comfort to move around and stops you from feeling confined. As this design is a quilt, there's lots of room, unlike a traditional mummy bag. You have lots of room at the head and feet which is great. However, because of this extra space, you won't be able to stay as warm as you would in a fully enclosed mummy bag, so this is something to consider. The quilt will work with 20 x 72 or 25 x 76-inch pads but will work best with its own Cosmo Insulated Lite or Astro Insulated Lite pads. You'd need to use it with a sleeping pad, and a separate purchase is required. 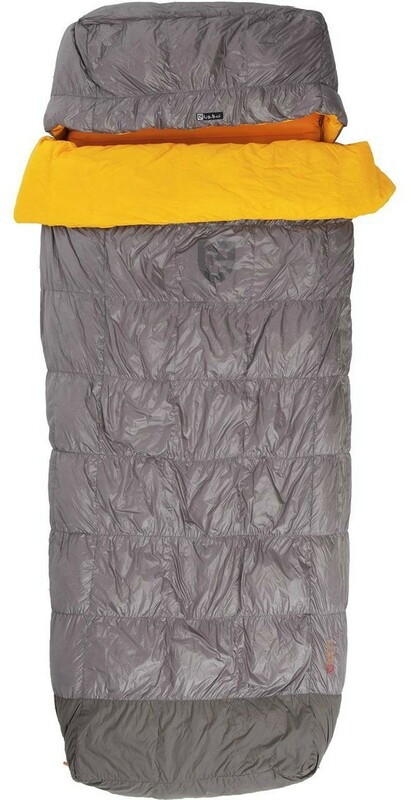 I’m a big fan of the Outdoor Vitals Summit Down Sleeping Bag. It's able to cut weight and save space by using high quality 800 Fill Down. As the material is Down, it’ll take longer to dry if it gets wet, but for this compromise, you’ll have a bag that’s lighter and smaller than a synthetic bag of the same standard. Pretty good compromise if you ask me. The sack can keep you comfortable in temperatures of up to 20F (-6), which is pretty impressive for its price. In fact, comparable bags start at around $250, but because Outdoor Vitals sells directly to the customer, the cost is a lot lower. The bag uses a grid baffle design, what that does is lock the Down into individual departments to make sure you don't get any cold spots throughout the night​, similarly to. It also utilizes a 20 denier ripstop fabric, which means it's extremely light and durable. Ideal for the abuse that the bag will get while getting knocked about on the back of the bike. The bag uses Large ​YKK zippers, which makes them easy to find in the middle of the night, as well as making them more durable. Additionally, they've also added a zipper baffle behind the zip to stop any draft coming through, and to prevent it from snagging. However, some reviewers have mentioned that this gets caught if you're not careful so be wary of this. The bag is coated in their Vital dry DWR coating to give it it's waterproof properties. However, this won't last forever, so it will need to be re-applied at some point. You can buy something simple like Nikwax Down Proof for a little cost and it'll protect it again. In this deal, you also get a lifetime warranty. Always something nice to see on a product as it gives you peace of mind if something were to go wrong with it. Weight: 2lbs 7oz without compression bag. Weight: 2lbs 10oz without compression bag. Related Post The Continental Grand Prix 4000s II Or The 4 Seasons? Go! 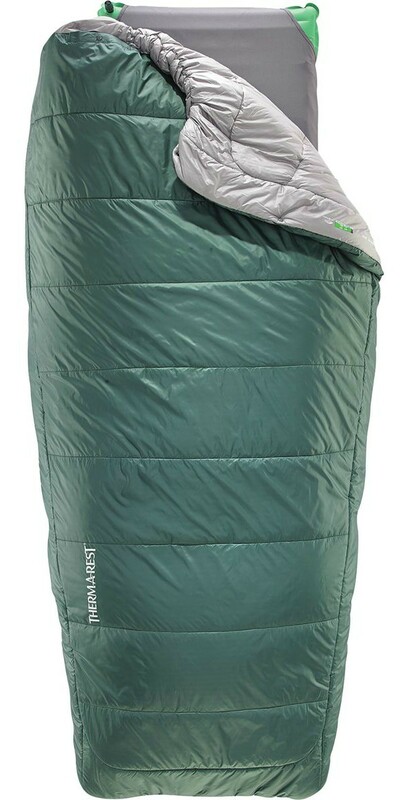 The Therm-A-Rest Regulus is another perfect alternative to a traditional sleeping bag, as with the Nano Tango Solo Down Comforter there is no bottom, so you'll save a lot of space and weight. The material is a lightweight 20d polyester and is very soft. It's breathable, which is perfect for the summer nights when you just need something to take the edge off, but don’t need anything that’s going to be too warm or stuffy. The quilt comes with a loop kit that you can attach to your sleeping mat. Although this quilt works well with the Therm-a-Rest sleeping pads that are up to 25” wide, you can use lots of other sleeping mats as well. With the loops, you would fix them to your quilt and then attach them to your sleeping pad. This quilt is suitable for temperatures as low as 40F, so when you’re getting close to that, you can attach the loops to secure the quilt and keep the heat in. Alternatively, if you need to vent the bag or stretch your legs out you can simply undo the loops and easily open it all up. As there is no bottom, it packs up small, so this quilt would be perfect for tourers who don’t need a super cold weather sleeping bag but are looking for something that’s lightweight and packable. Fits Up To: 6ft 5"
The Mountain Hardwear HyperLamina Spark 35 is one of the highest performance synthetic bags on the market. By using Lamina construction to weld the Thermal.Q insulation to the shell and lining, it's able to eliminate cold spots that are caused by traditional stitching. The installation has enabled a 32F (0) rating to be given to the bag. So not as efficient as other bags reviewed here but still a respectable temperature. What's more, by mapping different insulation weights throughout the top of the bag, it’s able to concentrate the warmth where it’s needed the most - your core and feet. By being strategic about where they place insulation, and by using a half-length center zip, they've managed to cut down on weight quite considerably. As it’s synthetic, it will dry quicker than a down bag, so this is something to keep in mind if you think there is a chance the bag will get wet. A tight fit reduces weight and bulk while maximizing thermal efficiency. It's the lightest bag here by some way, so if you're looking to save weight, this is the bag for you. However, if you're a bigger person, make sure you check the sizing to ensure that it'll you comfortably. There’s no point in having a great bag if you’re unable to fit into it! All of the bags here are great.​ However, the best is the Nemo Tango Solo Down Comforter. I think it's important to have adaptability while on a bicycle tour. This quilt gives you the option to be comfortable in the many different temperatures that you'll come across.